‘Large head’ pictures (ōkubi-e), showing just the head and shoulders of the subject rather than the whole body, became popular after the 1780s. 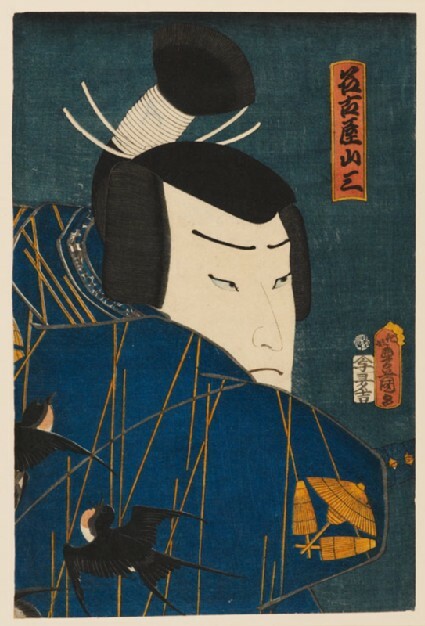 Ōkubi-e allowed the print designer to emphasize particular facial features, expressions or make-up of the actor depicted. Depiction of costumes also formed an essential feature of actor prints. Motifs and patterns on costumes often emphasize the emotions of a role, or reflect in some way the content of the play. The dashing young samurai depicted here is easily identified by his kimono, which is decorated with a distinctive pattern of swallows in the rain.